The Secretary of Foreign Affairs of Mexico, Jose Antonio-Meade and the Minister of Foreign Affairs of Belize, the Hon. Wilfred Elrington held a meeting in Mexico City to reiterate the bonds of cooperation and friendship between the two countries. As part of the historic visit of Minister Elrington to Mexico, the two ministers along with the Hon. Herman Longsworth, Minister of State in the Ministry of Education, Youth and Sports with direct responsibilities for youth and sports announced the kickoff of the construction of the Multipurpose Sport Facility at the “Marion Jones” Sports Complex. 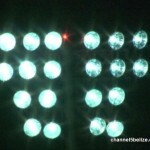 This project is fostered by the Ministry of Education, Youth and Sports of Belize with the Hon. Herman Longsworth at the helm of the project and will be financed with funds through the Infrastructure Fund for Mesoamerican and Caribbean countries (Yucatan Fund). This particular project is a direct response to a request from the Government of Belize, Prime Minister and Minister of Finance the Hon. Dean Barrow to the Minister of Finance of the Government of Mexico, as per letter dated 24 August, 2014. The launch of this project represents for Mexico the opportunity to contribute to the welfare of Belizean youth through the promotion of social inclusion, the prevention of violence and the restoration of the social fabric. Additionally, the multi-purpose sport facility is an expression of the coordinated efforts of Mexico and Belize to bolster social development and create opportunities for growth, as well as to strengthen the bonds of cooperation and deepen bilateral relations between the two countries. This project involves the design and construction of a multi-purpose sport facility and the installation of lighting on the existing football field. It will be named by Mexico, in appreciation for the support of the Mexican Government. The Government of Belize and the Government of Mexico, through the Mexican Agency for International Development Cooperation (AMEXCID), partner on initiatives to increase shared cooperation that boosts growth and raises the prosperity and welfare of both its population. After a series of delays and on-and-off construction that spanned several years, a “soft” opening of the Marion Jones Sports Complex was held today by present Minister of State in the Ministry of Education, Youth and Sports, Hon. Herman Longsworth. Since the last groundbreaking ceremony for the stadium in August 2009, the projected launch of the state-of-the-art facility had been put off multiple times. Still, the high-caliber multi-purpose sports complex is nearing completion, even if it is only in parts. At this point, the contract for the bleachers and accompanying facilities is complete, and the sports complex is in a usable state. During a media tour of the long-awaited stadium this afternoon, Longsworth elaborated on the progress of the project and its current stage. He said, “The contract for this complex is complete. When it was tendered, the cost came in much higher than the government had budgeted for, and so it was divided into 2 phases. “If you want me to speak to the entire complex, I would say it is 80% complete. The contract was specifically for this building and the parking area. We have not yet done anything with the parking, but the building is substantially complete except for what are to become the Sports Council offices on the 3rd level, and what is to be the press boxes and the VIP boxes on the 5th level”, he noted. “We’re also still working, but I expect those works to be completed on the ground level, which is the athletes’ locker rooms and showers etc. They’re not complete as yet, but we’re pretty close now to having them completed”, he further said. 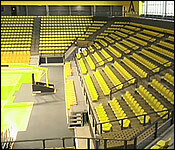 According to Longsworth, all the basic amenities such as bathrooms, concession areas, locker rooms, and seating are ready for public use, and he noted that while at this phase, the facility will only be able to accommodate track and field, football, cycling and beach volleyball, but when the indoor facility is completed, the stadium will be able to also host basketball, volleyball, boxing, karate and table tennis. He added that construction on the indoor facility should start by the middle of this year, courtesy of an expected $10 million grant from the Mexican government. As was mentioned, the almost $16 million building is also retrofitted with press boxes, office spaces for the National Sports Council, ticket booths, and a VIP lounge that is nearing completion. 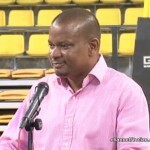 The Sports Minister also conceded that maintenance – which is vital to the upkeep of the sports complex – will be very expensive, and therefore, the possibility of turning over that responsibility to a private company is being considered. Even though the finishing touches are still being put on this segment of the project, we understand the facility will be open to athletes who need it to train for their different sporting disciplines. Longsworth told us that the general public will be allowed to use certain parts of the facility, but for a fee, which will be used to help cover the maintenance costs. He also stated that there will be an official opening of the Marion Jones as soon as all the works are properly completed. The grant was approved last April, along with 2 other projects in Jamaica and Saint Lucia by the Technical Committee of the Infrastructure Fund for Mesoamerican and Caribbean Countries in Mexico City. 8 yrs later.. still a mess. The Ministry of Youth, Sports and Culture has announced the signing of the contract for the lighting of the Marion Jones Sporting Complex project. The signing of the contract is between United Nations Office on Projects (UNOPs) and Maheias Construction for the installation of FFB- standard lights on the field of the Marion Jones Sporting Complex. This signing takes place at 10 a.m. Thursday, October 13th at the Marion Jones Complex. 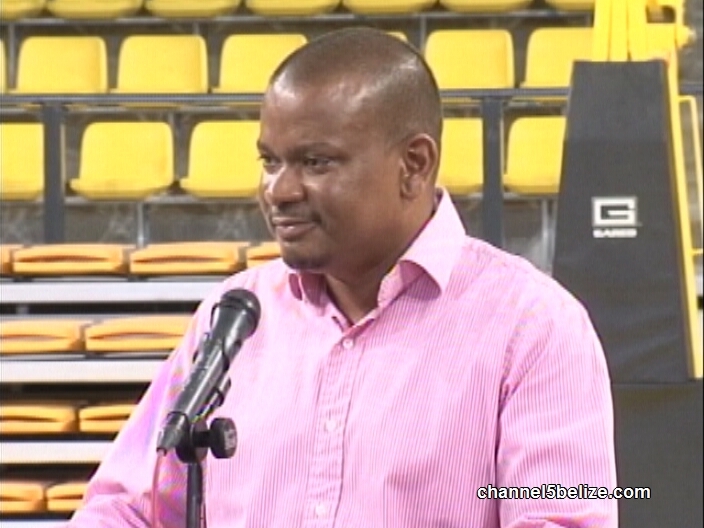 In addition, the Ministry of Sports will reveal the design of the indoor basketball and volleyball facility that will be constructed next to the Marion Jones Grandstand. Bids will go out for that contract shortly and construction is expected to begin by early January, during the dry season. 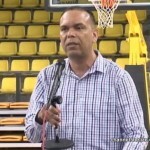 "We had some difficulty for the construction of a covered training facility that will not be at the federation approved level, the international federation level but will be there for the service of all Belizeans that are interested in this sporting discipline of basketball and volleyball. The ambassador Garcia Lopez who was here from the Mexican development cooperation initiative made it clear along with myself last night to the UNOPS people, UNOPS is an arm of the United Nations for Project executions, they were the ones who the Mexicans contracted to make sure that we get value for the 10 million dollars that they have invested in this initiative and so they are the ones who are over seeing, not the government of Belize and not the Sports Council; they are the ones overseeing the works that are to come under this initiative. Last night after the lighting ceremony the 2 ambassadors from Mexico and myself met with the UNOPS people and they shared with us a timeline for the completion of the rest of the project aside from the lighting and I'm pleased to announce that we're looking at an end of 2018 completion date, actually it is a bit longer than that, it may be the middle or so of January of 2019 but Belizeans can look forward to that facility." 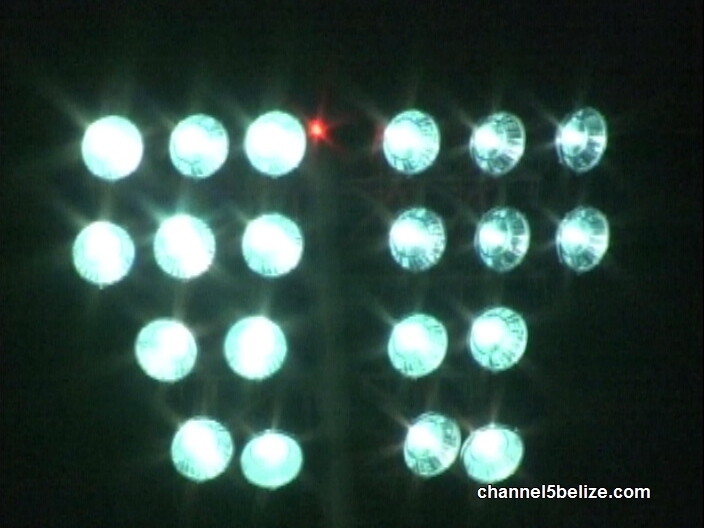 Wednesday night saw the launch of lighting fixtures for what is expected to be the crown jewel of Belize’s sporting facilities, the Marion Jones Sporting Complex. 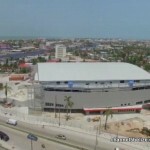 The Mexican Agency for International Development and Cooperation, AMEXCID, has become a key partner in advancing the development of the stadium to represent more sporting disciplines, with the building of a training facility for basketball and volleyball joining the athletics and cycling tracks as well as a football field. 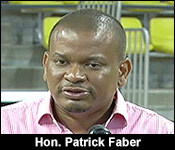 Sports Minister Patrick Faber says it is time to put aside the past issues and look forward to a brighter future. News Five’s Isani Cayetano has more. 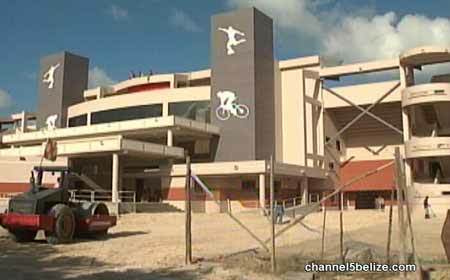 The Marion Jones Sporting Complex is easily the most delayed development project ever to be undertaken by the Government of Belize. With construction of the multimillion dollar facility finally completed, the stadium was illuminated on Tuesday night before an audience of government officials, including Mexican Ambassador Agustin Garcia-Lopez Loaeza, young athletes and sports enthusiasts. 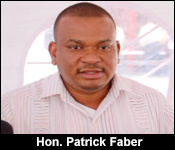 Minister of Education, Youth and Sports, Deputy Prime Minister Patrick Faber was on hand for the inauguration. The Mexican Agency for International Development and Cooperation, AMEXCID, has been instrumental in assisting the National Sports Council with this endeavor. 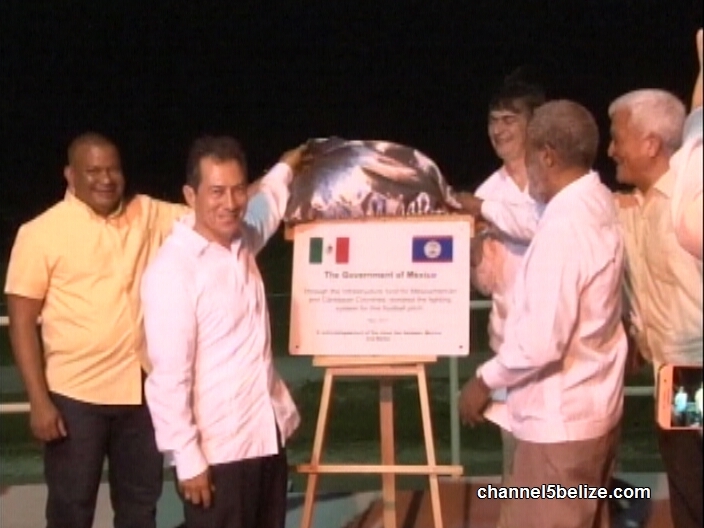 While the lighting of the Marion Jones Sporting Complex is only the first part of a ten-million dollar comprehensive infrastructure cooperation project for Belize which is financed by the Mexican government. The building of these recreational facilities allows for the creation of public spaces for Belizeans, in an effort to strengthen social integration, as well as promoting social and economic development in the country. Reporting for News Five, I am Isani Cayetano. A press conference will be held on Monday to announce the management company to take over the running of the brand new thirty-three million dollars Civic Center. The construction of the state-of-the-art facility, which has five courts and can be used as a hurricane shelter, concluded since last year, but its opening had been put on holding pending the award of the contract. 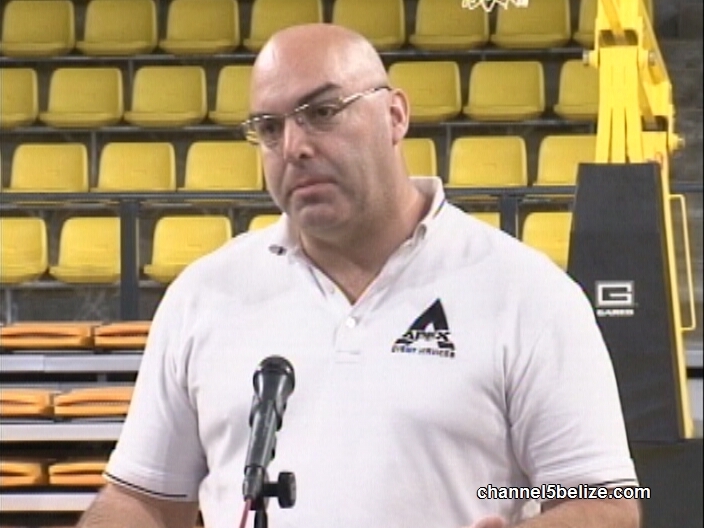 Now the company that has been picked is Apex Events Limited, which is owned by Chad Eckert, whose local partners in Belize are Lucinda Castillo and Reynaldo Malic, the co-owner of the Belize Defenders Basketball Team. We’ll have more details of this on Monday. 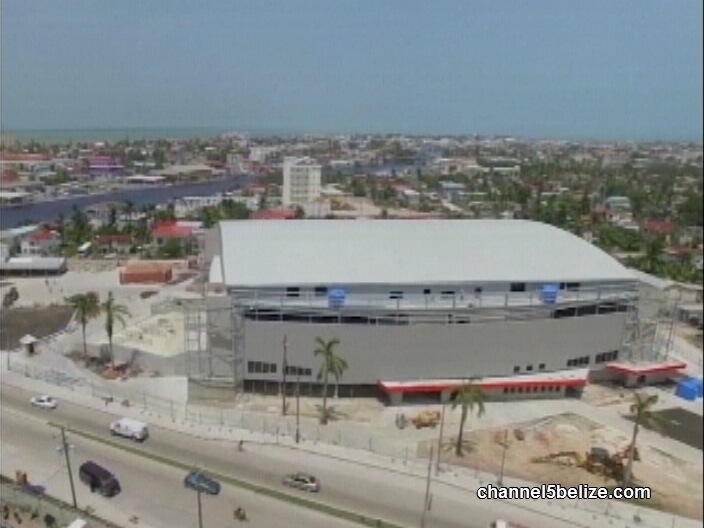 Finally, the Belize City Civic Center is ready for sporting and other activities such as conventions, concerts and expos. Earlier today, a contract was signed with a U.S.-based company to assume management of the thirty-three million-dollar state-of-the-art facility. Apex Events Services Limited, through its local subsidiary, was selected over other bidders for a two-year contract in the first instance. 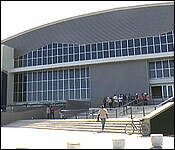 Apex will have to utilize the facility on a daily basis to generate enough income for the running of the civic center. News Five’s Isani Cayetano was present at today’s signing and files the following report. The Civic Center, built at a staggering cost of almost thirty-three million dollars, is finally set to open its doors to the public at the end of April. The official launch will succeed a forty-five day period during which its new managers will be outfitting the sporting and conventional facility to their specifications. 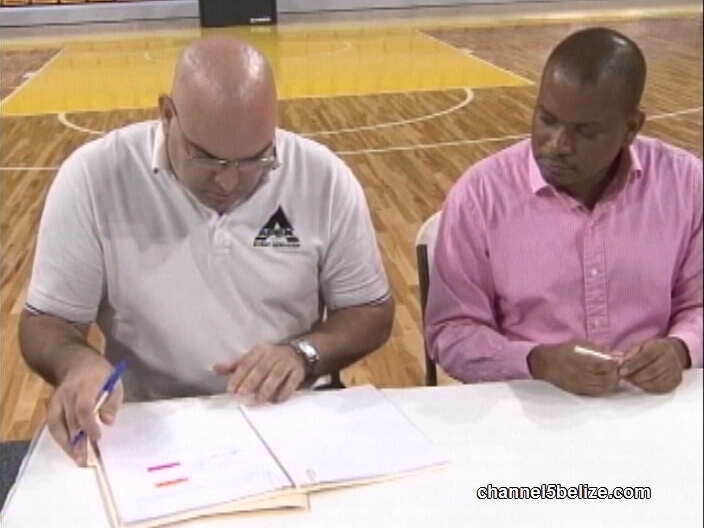 The three-year contract which was signed this morning is a joint agreement between the Government of Belize and Apex Events Services Ltd. The idea, says Chad Eckert, is that the locally managed company will be able to capitalize on the use of the available floor space both in and out of the building. 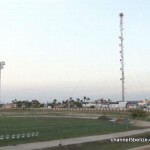 Chad Eckert, Proprietor, Apex Events Services Ltd.
What has been of concern to residents of Belize City is the availability of the multipurpose complex for public use. Government has gone to the pains of stipulating in the agreement that a thousand hours must be set aside for community use. In order to meet its operational expenses and turn a profit, Apex will have to create a schedule of activities that will see the Civic Center in use virtually all year round. 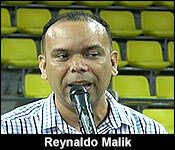 Reynaldo Malic, General Manager, Apex Events Services Ltd.
3 months ago, we took you inside the Belize Civic Center to show you just what the contractors had built for just under 33 million dollars. 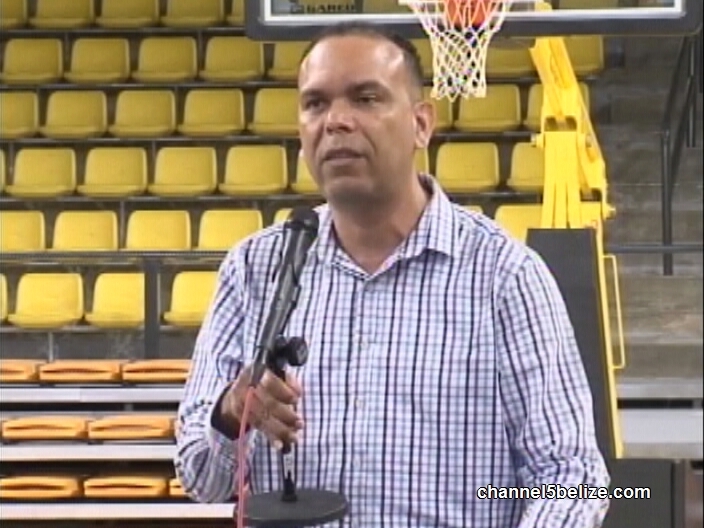 Even though the facility was completed, the Ministry of Sports was not prepared to open it for public use because they wanted to find a management company to take over its day to day operations. The logic was that the Government wanted to protect this very expensive facility so that it could be handed over to the private company in pristine condition. It took a lot of careful consideration, but the Government and Belize Infrastructure Limited have decided that from all those companies who put in a bid to run the Civic, the US company, Apex International LLC is the best fit. To be able to operate in Belize, Chad Eckert, the proprietor of Apex International has registered a local version of his company called, Apex Belize Limited. 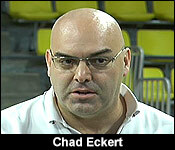 Reports to 7News are that the directors are Eckert, Lucinda Castillo, and Garth Guthrie. "We finally came to a decision of the preferred conditional bidder. We went into some final negotiations with the contract with Apex International LLC, and we are now here today with the company which will now be taking on the process." "I'm absolutely happy, I am absolutely convinced that in signing this management contract that the Government is operating in a manner that fit and proper. I am pleased that under my leadership, we can sign this agreement with such a reputable firm." "On behalf of Apex Belize, I'd like to say that we are extremely pleased to be the successful bidders for the management of the new Civic. This is an impressive facility." "It's a truly state of the art type of venue that is here. There's lots of opportunity that you can do here. The way it was built was - there's a lot of things in it that I didn't think would be in it. When I found out that it was, I was very impressed of different things that were already incorporated into the building. There were ideas that when I first came here, I said I would have wanted to do this, this and that. I come to find out that you guys already thought about that, and it was already in there. So, I'm very impressed with the building overall." 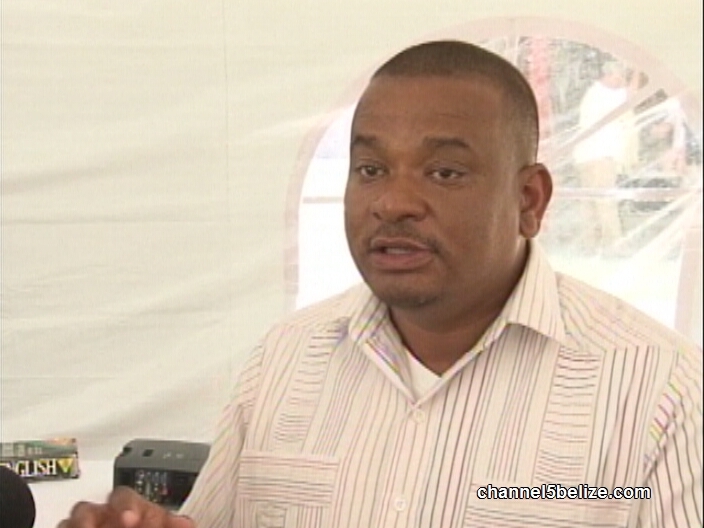 "The concern has been that this facility is too expensive for Belizeans to maintain. So, can you give us assurances that you and your team will be able to maintain the facility and generate the type of income necessary to run the services around it?" "It's no secret how much it cost to build. That being said, there are 365 days to the year. The secret to generating the revenue not just to cover the expenses of the civic, but also to generate revenue back to the government and to make a profitable venture for Apex, is going to be in our ability to utilize all 365 days of the year. That's, in essence, the sort of secret sauce when it comes to venue management. Not only are there 365 days in the year, but there's also 24 hours in a day, which means that we can have multiple events on every single day. That's up to us to come up with a good conversion team that convert, for instance, from a convention in the day, to a basketball game in the night, and then back to something else the following morning. Our combined experience, Apex's combined experience, is exactly in that particular area of expertise, We are going to be able to do that, and not only cover the expenses on an annual basis, but also, like I said, generate revenue for both the Government of Belize and Apex." "In the US, we've done everything from small intimate VIP parties that may have a few hundred people, up to basketball games that have 8,000 people, up to large concerts that hold about 60,000 to 70,000. So, we have a wide range of experience in every type of aspect that you can think of that could be sponsored here." So, to a bit more of the specifics: we told you last time that the technicians have estimated that it will cost between $800,000 to a million dollars to run the civic for 1 year. 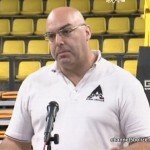 Apex will be responsible to try and rent the facility over the course of that year to cover that cost. After that, whatever revenues they generated above operations costs, will be split between the company and the government in a profit sharing mechanism. The initial contract with Apex to run the facility is for a 3-year term. The company must be making that nearly one million dollars annually for their management of the facility to be considered a success. If they are not, then their management will be considered a failure, and bids will be put out again for a new manager to be identified. If they can meet the operational costs for those 3 years, then, they get priority for a renewal. Any revenue above that will be shared 75% to the Government and 25% to the company. The more successful they are, the bigger their share of the profits be until, until it reaches a ratio of 50/50. Of course, there are those 1,000 hours of free use by the Government and the new managers, which will be carefully worked out to provide all the key stakeholders an opportunity to access the Civic. 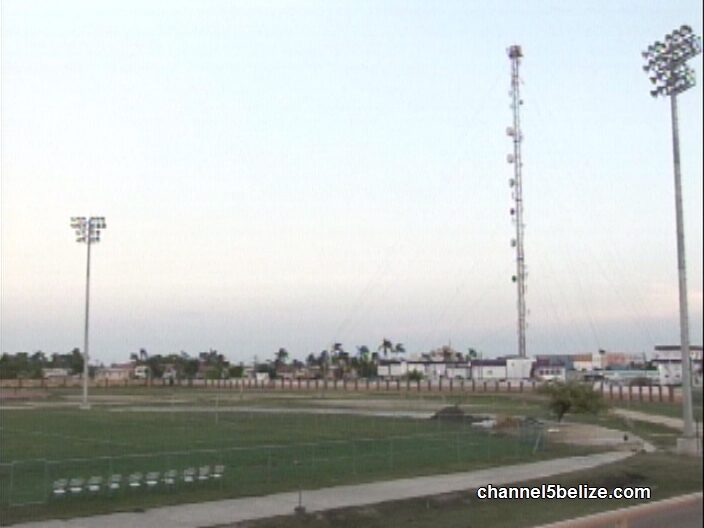 The Belize Infrastructure Limited (BIL) fired off a release dismissing claims that the Belize Civic Center Management Contract is in any legal breach of the laws of Belize. In the release, BIL states that the claims are baseless and politically motivated. The Belize Civic Center Management Contract was awarded to Apex Event Services – Belize Limited which is owned and operated by Chad Eckert. Before signing the contract BIL says that it ensured full legal review and approval from the Office of the Solicitor General. 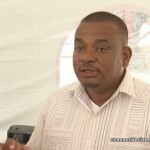 Last week Thursday the People’s United Party release a statement in which it claimed that the Financial Secretary Joseph Waight confirmed that there is no guarantee agreement between the Government of Belize and Apex Belize Limited. But if such guarantee exists, the PUP asserted that the government has once again violated the Finance and Audit Reform Act. However, BIL has rebutted, saying that there is no breach of the Finance & Audit (Reform) Act. The Act, according to BIL, mandate requirements of the Government when it barrows monies or when guarantees as additional security for private entities in the event that they cannot make repayments to the banks is provided. 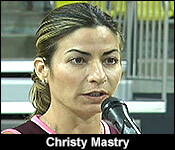 BIL’s General Manager, Christy Mastry, says this is not the case. 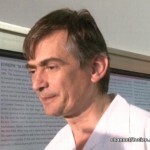 The contract will be upload on BIL’s website on Monday when it is relaunched. A week ago, we told you how the PUP was calling out the Government and Belize Infrastructure Limited on the management contract with Apex Belize Limited for the Civic Center. The commercial arrangement with the private company and the Government is set up to try to ensure that the Government and taxpayers don’t pay a cent to keep the facility open. What the Government and BIL did is that the experts were tasked to find out how much it would cost to run the facility for 1 year. That was determined to be about 850 thousand dollars, and so, the commercial arrangement between the Government and Apex agreed that Apex must manage the facility, and raise the revenue required to cover that entire bill to keep the lights on, and the Civic open for business. Beyond that, the facility is to be kept in a pristine condition. So far so good, but the problem with the arrangement is what happens if Apex cannot raise the money to foot the operational costs? Well, that’s when the Government will step in and put in the rest of the money meet the shortfall. 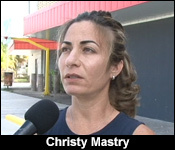 BIL’s general manager, Christy Mastry described it as a “guarantee”, and immediately, the PUP zoomed in on that term, interpreting it to mean a sovereign guarantee. Now, in the current climate, especially with the unresolved UHS debt of 90+ million dollars, the term “sovereign guarantee” is not lightly tossed around. So, Mastry and Deputy Prime Minister Patrick Faber were roundly condemned by the PUP, which said that if there is any “guarantee”, they are breaking the Finance and Audit Reform Act, by not getting parliamentary approval. "The word guarantee the way it was used by myself as a professional architect has no negative connotation whatsoever. The reason it was taken in that light is just because of recent very negative connotation and the way that was used as an actual contractual guarantee was forcing the government into debt incurred by a failed contract to a 3rd party debtor. We have no such mechanism in our contract. When the contract is reviled on Monday, April 16th on our BIL website that will be relaunched along with all of our other construction contracts you will see that the paragraph speaking to any payment, speaks only of a compensation mechanism as a payment to services rendered for a company should they deliver their part of the services we commit/guarantee to commit to the payment mechanism." "The opposition takes the interpretation this is a guarantee. You government are guaranteeing that if they fall short of this 850,000 thousand, we the Belizean, the tax payers will make up that short fall. Is that in anyway related to a guarantee, a sovereignguarantee?" "It is a compensation, we have to pay them for services. We have hired a company, make no mistake we have hired a company. We could have done two things, we could have said 850,000 thousand is now allocated from the actual government purse. Two the national sports council and that is what they will use to run this facility for the year then we would have no opportunity to make a dollar off the facility and potentially we would not even have the money to continue to maintain it after the first year. That money has to go somewhere, the facility has to paid for. The way the wording is written and everyone will see it on Monday. If there is a shortfall, if the company only makes 400,000 thousand the government will pay them in a compensation mechanism to a maximum of 850,000 thousand. No more than amount and no less than that amount. Therefore we are now putting the project into the ability to earn revenue and sustain itself over its lifetime." "Are you confident that this compensation mechanism is not falling a foul of any financial recollection?" 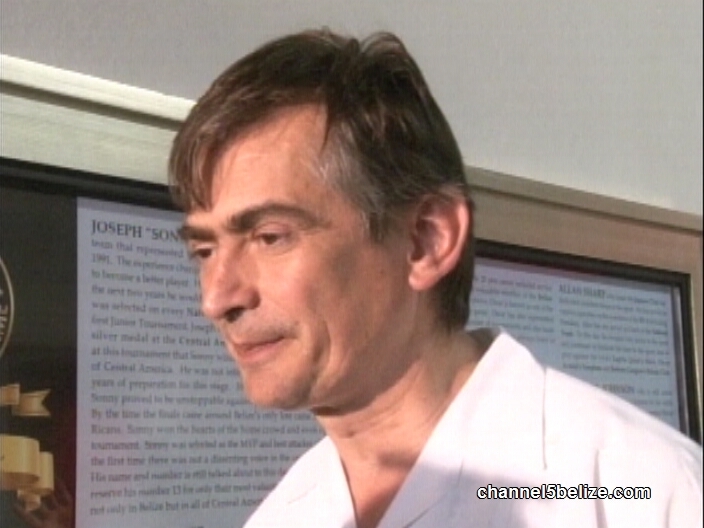 "This compensation mechanism is no different than if the government of Belize hired a media company to provide them a service for 3 years to cover them to do press releases, to do whatever on air - interviews they have to do and to provide them with a general service that they are obligated by a contract to compensate them toward doing. Should that service not be provided, the government just like any government would have the right to terminate and seek a different private party to provide the same service." The BIL manager says that the full details of the contract will be posted on their website next week Monday.